Since we are studying forests, I thought it would be particularly appropriate to write about an issue currently unfolding in a national forest not far from Buffalo. 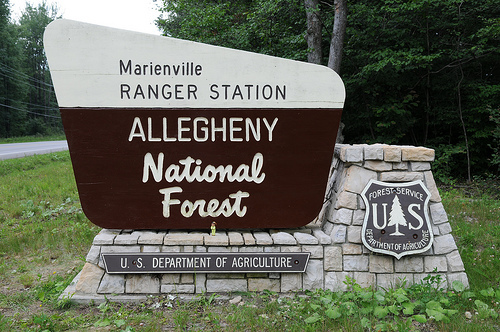 Allegheny National Forest (“ANF”) is located in northwestern Pennsylvania very close to the New York border. The federal government did not always hold the land comprising the forest. As authorized by the Weeks Act of 1911, the Secretary of Agriculture purchased the land from private owners. In 1923, President Coolidge designated lands purchased in northwestern Pennsylvania the Allegheny National Forest. Due to limited funds, the Secretary was only able to purchase the surface estate of most of the land that comprises ANF. As a result, approximately 93% of the mineral estates in ANF are privately owned. According to Pennsylvania law, the mineral estate is the dominant estate. The mineral rights take one of two forms: reserved or outstanding. Reserved rights were reserved by the fee owner who conveyed title to the surface estate to the federal government. Outstanding rights were severed from the surface estate before title to the surface estate was conveyed to the federal government. Oil was discovered in the Allegheny Plateau in 1859 so this severance could predate conveyance of the surface estate to the federal government by many decades. Initially, the Weeks Act only authorized the purchase of surface estates with reserved rights; however, in 1913 it was amended to allow the purchase of surface estates with outstanding rights. The distinction between reserved and outstanding rights is important because it determines the relationship between the owner of the surface estate (the federal government) and mineral estate (private parties). For reserved rights, the relationship is governed by the terms of the deed. The federal government may exert control over these rights only to the extent provided for in the deed. Specifically, these deeds stipulate that a permit is not required for “surface use, occupancy, or disturbance.” For outstanding rights, the relationship is governed by the 1980 holding of the United States District Court W.D. Pennsylvania in United States v. Minard Run Oil Co. This holding states that the “owner of mineral rights has an ‘unquestioned right’ to enter the property to access and extract his minerals” subject to several restrictions. These restrictions include the provision of a map of operations, a plan of operations, and proof of ownership of mineral title no less that 60 days before the commencement of drilling operations. From 1981 to 2009, terms contained in deeds and the guidelines articulated in Minard Run controlled the relationship between the Forest Service and private mineral estate owners. Additionally, the 1986 Allegheny National Forest Forest Plan does not require preparation of an EIS for private oil and gas projects. In 2009, however, prompted by litigation and a change of heart regarding the applicability of NEPA to drilling in the ANF, the Forest Service declared that no new proposals for drilling would be approved until a forest-wide EIS was complete. See FSEEE v. U.S. Forest Service, No. 08-323. 2009 WL 1324154 (W.D.Pa. May 12, 2009). In response, Minard Run Oil Company, the Pennsylvania Independent Oil and Gas Association, the Allegheny Forest Alliance, and several other parties sued the Forest Service. Minard Run Oil Co. v. U.S. Forest Service, No. 09-125, 2009 WL 4937785 (W.D.Pa. Dec. 15, 2009). Minard Run and the others alleged that the preparation of a forest-wide EIS and accompanying suspension of new drilling amounted to a de facto drilling ban in violation of NEPA and the APA. Additionally, they requested a preliminary injunction to allow new drilling to move forward. The District Court granted the preliminary injunction and found that the Forest Service violated both NEPA and the APA. With regard to NEPA, the District Court found that issuing drilling permits was not a major federal action. With regard the APA, the District Court found that the drilling ban was instituted without a proper notice and comment period. In September, the Court of Appeals for the Third Circuit affirmed these findings and the preliminary injunction. Minard Run Oil Co. v. U.S. Forest Service, No. 10-1265, 2011 WL 4389220 (3d Cir. 2011).